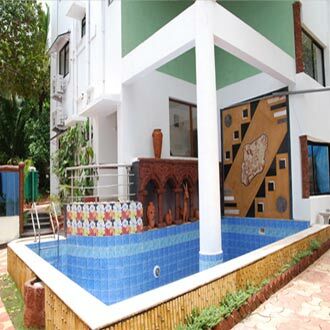 This boutique property is located close to the Calangute Police Station and is amidst the lush green hills of Saligao. There are seven standard rooms and two deluxe suite rooms across its two floors. Guests can enjoy a dip in the resort's swimming pool, which has no time restriction. One can enjoy some yummy snacks and exotic cocktails and drinks, which is served by the poolside restaurant "Village Kitchen", which offers an array of Indian, Chinese, Continental and Goan culinary delights.